Burt’s a professional but he’s just one man so I asked the guys at WoodNet to tell me about the advantages and disadvantages of a guide system + circ saw vs. portable table saws (that was before I realized that Burt actually pits guides against stationary table saws). Not all Woodnetters believe that guide systems and a great circular saw can replace their table saws and portable table saws though. “However, on the job site, I use the portable table saw more for ripping and sizing framing/remodeling material—things the guides will not do. Let’s start with the remodeling materials. I can take an EZ rail and rip 2x material – in fact up to 3″. I can add a square and cross cut plywood and solid wood more accurately than a table saw ever thought about. Need a tapered piece or an out of square piece of pw – no problem. A few months ago, I mounted an Incra miter gauge on an EZ rail. Someone asked if it would do miters well so I made a frame like a picture frame – just quick cuts. The results were better than the results from most miter saws. 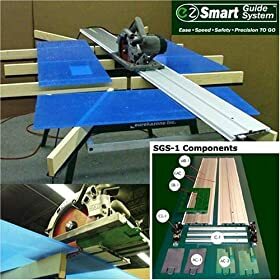 I have replaced my job site table saw with the EZ guide system. The guide system is more accurate and gives a better quality of cut while being much safer. You said the rail will not make small parts. Let’s see if this is small enough. A couple of days ago, we had a regular woodworking customer in the shop and I was showing her what the EZ could do. First I ripped a piece of 3/8″ x 3/4″ maple into two pieces about 1/8″ x 3/4″. Next I cut a 3/4″ piece off the end of the strip so I had a piece that 3/4″ x 3/4″ x 1/8″. Then I laid the piece on the table and made two triangles that were less than 3/4″ x 3/4″ on each side. How small do you need. Sell Your Table Saw, Buy a Guide? No. Not at all. Unless you’re Burt because that’s what’s working for him. Look more closely at the Festool and EZ guide systems? Yes I think you should. There may be a bit more application you can get out of them that could save you time and effort. If you’re a DIYer looking for near-professional quality accuracy I think you would do well to consider the Festool or EZ guide system as a table saw alternative. Watch the EZ Smart Guide System in action in these videos on YouTube. I just made a jig out of 1/4 plywood, 3- 72″ rulers from ACE hardware and the part of the crosscut/angle giude that rides in the slot of my delta table saw that I will put up against one of them fancy store bought guides, lol. the guide from the table saw is bolted to the bottom of my skill saw and the rulers rest on two pieces of the 1/4 plywood glude and stapled to a 12″ section of 1/4 inch plywood forming a channel for the guide on the saw base to ride in. I just made a few rip cuts in some 3/4 inch cedar, staightest cuts I ever made, lol..I need to trim a couple doors So i wanted an idiot proof guide..I didn’t trust me and a single edge guide..Think of it as an inverted ez guide. Rulers cost $30.00. One could screw a block of hardwood to the base and make a channel out of plywood or hardwood for it to ride in also. I just watched the E Z system on U tube..much more then a ripping guide, my bad. I will hafta get me an ITEM extruded aluminuim catalog.